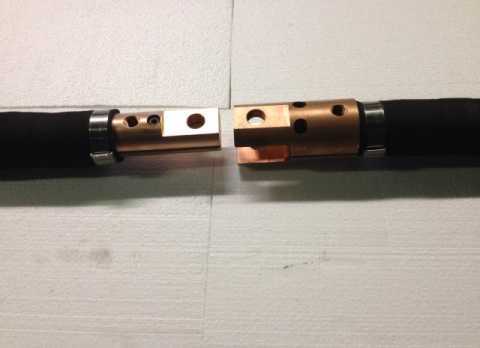 Cal’s "Swivel-King" Dual Conductor Cable is one of the greatest innovations to hit the spot welding market in years. Cal invented and patented the "Swivel-King" in 1990 with the robots in mind. We found, however, that manual jobs received the greatest benefits. This cable will allow the welding head to twist 180 degrees, with as little as 15 lbs of pressure. The swivel feature relieves stress on the shoulders, arms, and wrists of the welders on the floor. It has made life a lot easier on people and robots alike. The "Swivel-King" can be ordered in any length, MCM size, or terminal combination. The only extra information required is where do you want the swivel placed? Every machine is different so the placement of the swivel can vary with any operation. Simply look at the operation and find a place back from the welding head where there is very little bend in the cable. Measure back from the bolt hole center on the existing cable and give us that measurement. Basically the "Swivel-King" feature breaks the hose and allows the cable to move freely inside. The Cal line of cables includes cables for robotic welders. We have the capability to produce large production runs. **Our Kickless cables are built with or without the Swivel King. The Swivel King allows the cable to twist 180 degrees in either direction - thus, where other cables have minimal bend capacity, the SWIVEL is designed with maximum bend and twist in mind, taking the stress off of relief ends and eliminating the need for additional bumpers or strain relief sleeves in most cases.